This photo of me was taken after a yoga conference I attended a few years ago. It was one of the best days of my life. I was relaxed, completely at ease, and most of all content. 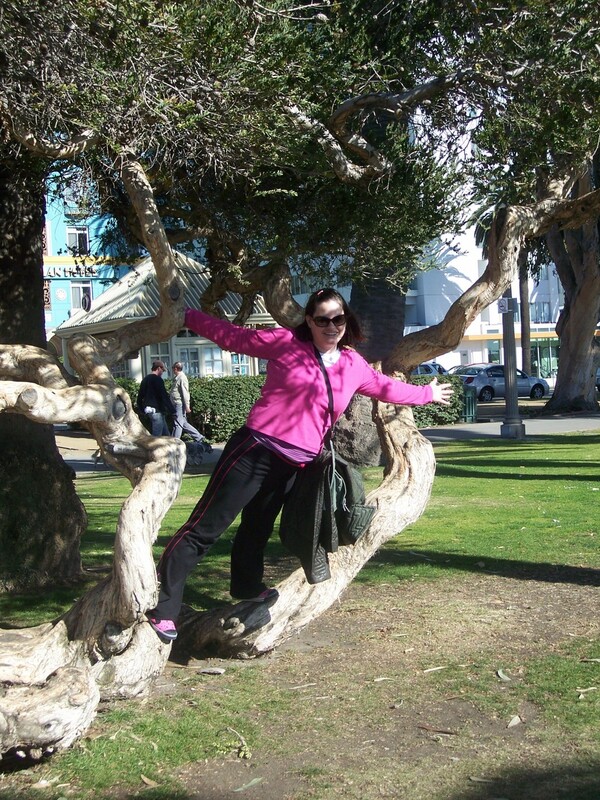 I was in LA near Venice Beach walking the boardwalk and saw this tree and wanted to do random yoga poses. This one is simply me grounding in the tree, using the tree to support me, and reaching up, allowing the universe in. Put simply, I was just allowing things to happen. On this day the yoga conference was over and my flight didn’t leave until the evening, so I made a new friend and we went down to the beach. We walked the boardwalk and truly enjoyed the day. At one point we went to a yoga studio and somehow she got in free and I didn’t want to pay (and I was starving) so we split up. I went to a pub and had the best fish and chips and beer I think I’ve ever had. I then walked around the area some more before taking the bus back to LAX. I just allowed the universe to take me wherever and I really enjoyed myself. I was in the moment throughout the entire day. One of my downfalls is that I am a control freak. It took a lot for me to just admit it. I need to be in control. I truly don’t like it when I don’t know what’s in store for me. I plan vacations. I plan my weekends (even if it’s sitting on the couch for 12 hours… it’s planned). Sure, I can be spontaneous, but nothing big. I’d love to just pick up and go to Vegas this weekend. But it would never happen. Maybe I should let it happen. When I’m not in control I feel in flux, in limbo, confused, and in general out of sorts. I then have to get grounded. I ground myself by writing, dancing, exercising, and of course- yoga. How do you ground yourself? Tree pose is one of the most grounded poses I can think of. Sure, easy pose and lotus you’re sitting on the floor, bottom grounded, but in tree pose, if you don’t ground… you fall. And if there was a goal in yoga… remaining tall in tree pose would likely be a goal. Tree Pose: Start in Mountain Pose, both feet planted on the floor, hip width apart, or a little closer depending on your comfort level. Ground your feet into the ground, lift up your toes and find the spot between your heels and the balls of your feet where you are centered. Allow your toes to spread and grip the floor. Stay grounded. Relax your feet, stop thinking about them, they are supporting you. Stand tall. Knees are a little loose (not locked). Hips are squared and pelvis is tucked a bit (aka- your bottom is a little tense). Imagine a string pulling your spine straight, up through the neck and head. Shoulders back, chest open. Arms are relaxed, but still remain a bit active by the side. Mountain. Strong. Grounded. Imagine your left foot rooting into the floor. Find that balance and slowly lift the right leg to the side, opening the hip and knee to the side of the room (your feet would be in an “L” if they were lined up). Your right foot lifts along that leg. Find where you are comfortable. It may be your ankle, or up to the crook of the thigh. (Be aware of placing your foot on the knee joint so there’s no damage.) Lift your arms where comfortable. Sometimes I like my arms to be a weeping willow, a tall oak, and sometimes swaying in the wind. Breathe. Allow yourself to accept the pose, accept what comes (falling, standing, swaying, a child or dog disrupting you…). Release arms and leg and change to the other side rooting through the right foot. When you’re ready to release the right foot, come back into mountain and be mindful of yourself. Do you feel grounded? Uplifted? Centered? Off-balance? Just let it be and go with it. Breathe, relax, and be in the moment the universe just provided to you. Judgment free. Ego free. May each being find peace. May each being find happiness. Robyn is the resident yoga instructor on this site. I have been practicing yoga since 2000 and became a Certified Integrative Yoga Teacher in 2005. I became a teacher to learn more about yoga and integrate it more into my lifestyle. I then realized that I wanted to make yoga accessible to everyone. I have taught at Y's (YMCA & YWCA), community centers, community colleges, and various other locations throughout the decade. I hope that through this blog we can explore yoga together.